Love smolders with passion in this smokey quartz gemstone ring. The 10mm by 10mm gemstone is crafted into a stunning heart shape and boasts that special color that only smokey quartz reveals--subtle but alluring. This sparkling quartz gem is accented by five white diamonds that heighten the radiance of the ring. The diamonds are set in 14K white gold, which also holds the smokey quartz tightly in place. A band of white gold perfectly complements the gems and lets this beautiful ring slip comfortably on for all-day wear. 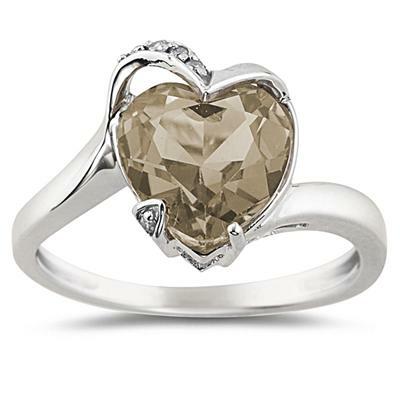 We guarantee our Heart Shaped Smokey Quartz and Diamond Ring in 14K White Gold to be high quality, authentic jewelry, as described above.